Logano took the pole with a lap at 127.071 mph. His time in his fast laps around the .75-mile race track was 21.248 seconds, .046 seconds faster than the effort of second-place qualifier Denny Hamlin (126.796 mph) of Joe Gibbs Racing. Stewart-Haas Racing’s Kurt Busch (126.606 mph) will start third, followed by AJ Allmendinger (126.570 mph) and Kevin Harvick (126.428 mph). 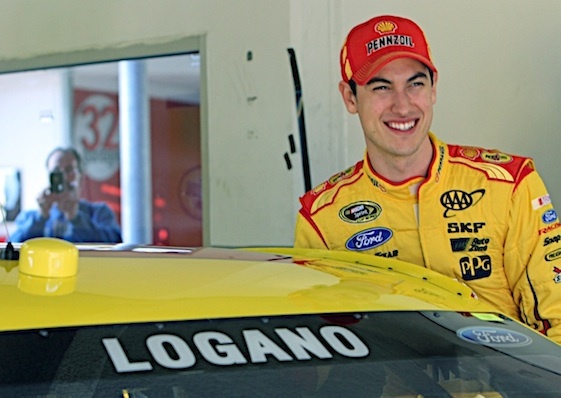 Logano credited the pole win to his crew’s decision to radically loosened the car up. “When you’re sitting 11th on the board (actually 10th after the second round), you’ve really got only one spot to lose, so we swung at it,” said Logano, who notched his first pole at Richmond and the 11th of his career. “It’s not normal for us. Normally, we’re really fast in the first round, and it’s hard for us to stay that fast throughout it. Hamlin was fastest in the second session, but tire wear was a factor in his second-place run in the third round. (22) Joey Logano, Ford, 127.071 mph. (11) Denny Hamlin, Toyota, 126.796 mph. (41) Kurt Busch, Chevrolet, 126.606 mph. (47) AJ Allmendinger, Chevrolet, 126.570 mph. (4) Kevin Harvick, Chevrolet, 126.428 mph. (78) Martin Truex Jr., Chevrolet, 126.115 mph. (2) Brad Keselowski, Ford, 126.027 mph. (20) Matt Kenseth, Toyota, 125.821 mph. (1) Jamie McMurray, Chevrolet, 125.587 mph. (18) David Ragan, Toyota, 125.471 mph. (24) Jeff Gordon, Chevrolet, 125.348 mph. (42) Kyle Larson, Chevrolet, 124.977 mph. (14) Tony Stewart, Chevrolet, 126.416 mph. (55) Brett Moffitt #, Toyota, 126.410 mph. (27) Paul Menard, Chevrolet, 126.357 mph. (25) Chase Elliott(i), Chevrolet, 126.328 mph. (15) Clint Bowyer, Toyota, 126.310 mph. (19) Carl Edwards, Toyota, 126.227 mph. (40) Landon Cassill(i), Chevrolet, 126.180 mph. (3) Austin Dillon, Chevrolet, 126.168 mph. (10) Danica Patrick, Chevrolet, 125.757 mph. (51) Justin Allgaier, Chevrolet, 125.657 mph. (31) Ryan Newman, Chevrolet, 125.511 mph. (17) Ricky Stenhouse Jr., Ford, 124.960 mph. (13) Casey Mears, Chevrolet, 127.310 mph. (88) Dale Earnhardt Jr., Chevrolet, 127.262 mph. (43) Aric Almirola, Ford, 127.071 mph. (98) Josh Wise, Ford, 127.053 mph. (9) Sam Hornish Jr., Ford, 126.892 mph. (38) David Gilliland, Ford, 126.826 mph. (35) Cole Whitt, Ford, 126.802 mph. (16) Greg Biffle, Ford, 126.695 mph. (30) Jeff Green(i), Chevrolet, 126.654 mph. (6) Trevor Bayne, Ford, 126.559 mph. (32) Joey Gase(i), Ford, 126.541 mph. (48) Jimmie Johnson, Chevrolet, 126.517 mph. (26) Jeb Burton #, Toyota, 125.517 mph. (62) Brendan Gaughan(i), Chevrolet, 124.746 mph.